The famous place, built by the film director Emir Kusturica for purposes of shooting the film “Life is a miracle”, originated between two very special mountains – Zlatibor and Tara. This unique ethno village, also known as Kustendorf worldwide, is located on Mećavnik hill pertaining to Užice municipality. There are about thirty buildings of various contents in Drvengrad, while the shape of village itself is rectangular. On one side of its longer axis, there is a front gate from which the main street spreads along the other side, where a small, wooden, Orthodox church with a wooden belfry is located. The church is built on the basis of the Russian church chalets and it is dedicated to founder of the Serbian Indipendent Church – Saint Sava. In center of the village, there is a square, paved with wooden cubes and wooden-cut thresholds, which is surrounded by authentic chalets brought from the closest parts of Serbia and Republika Srpska. 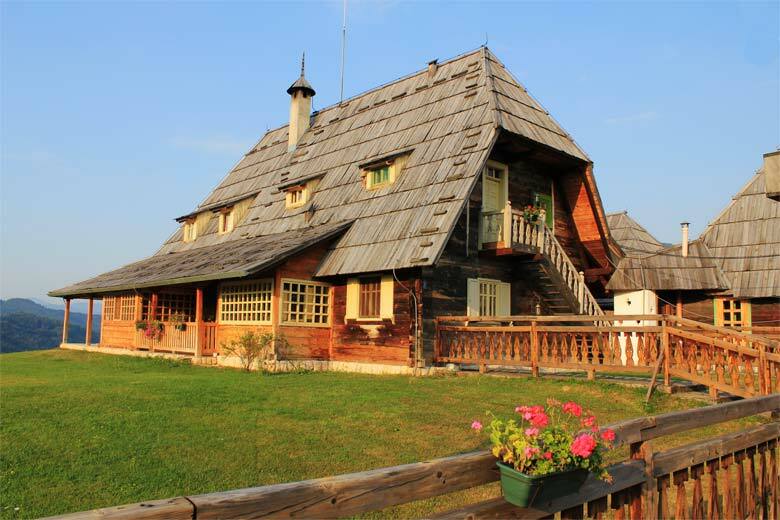 The houses are mainly built in the traditional Zlatibor style, as well as the library, stores, teahouses, cinema and many other facilities. This cultural, artistic and traditional unit, extraordinarily and imaginatively rich in elements, characteristics and tourist contents of Western Serbia, is absolutely ultimate in its authentic details. Traditionally and luxuriously furnished wooden chalets in mountain style, numerous restaurants, patisseries, congress space, swimming pool, sports halls, courts and ski slopes formed Drvengrad, with the nearby narrow-gauge-railway Šargan, in its entirely preserved natural manner. As a result of that, Drvengrad represents one of the most significant tourist landmarks of Serbia. The adventure of taking the old steam train “Ćira” will take you through rocky gorges and high cuts between Šargan and Mokra Gora, the route on which the train tracks make an unusual trajectory shaped in number 8, by which with certainty you will complete your stay in this almost unreal, small but extraordinary place. It is very interesting that the streets here are named after famous people from the world of culture and science. The main street is named after the Serbian Nobel prize winner Ivo Andrić, yet there are also streets named after the Cuban revolutionary Ernesto Che Guevara, Argentinian football player Diego Maradona, Serbian actor Miodrag Petrović Čkalja, as well as the world-known film directors such as Federico Fellini and Ingmar Bergman, while one of the streets is named after one of the best tennis players in the world – Novak Đoković. Many famous people from the world of art and film, such as the Russian film director Nikita Mikhalkov, Italian beauty Monica Bellucci and top American actor Johnny Depp, visited Drvengrad. Therefore, we see no reason why you should not take the same opportunity to stay there as well, and discover so much beauty that is located so close to you.